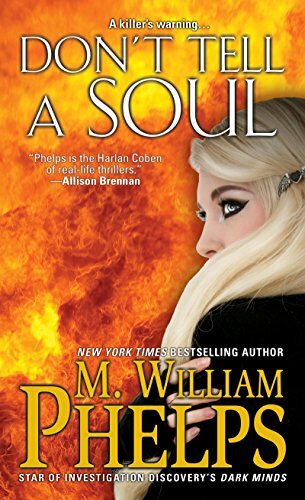 Don’t Tell A Soul by M. William Phelps – Books, Books and More Books! Mr. Phelps is the only true crime writer I will read. He is the expert. Somehow he gets inside of the murderous villain explaining how and sometimes why they do what they do, and he also brings the victim, the innocent ones to the forefront fo the story. Kim Cargill is a narcissist, a psychopath, a sociopath and just a down right mean woman! A horrible mother, abusive to her children and her husbands. A bad egg! Cherry Walker is the exact opposite. While she may have the mind of a child, she knows right from wrong and isn’t going to compromise herself for Kim. Unfortunately we know from the beginning of the book that Cherry was killed. And in the end of this book, that will be who and what you remember. Cherry Walker, who stood up to the hell that was Kim Cargill. Thank you Netgalley and Penguin Random House for this book! Crime writer, serial killer expert and New York Times bestselling investigative journalist M. William Phelps is the author of 30 nonfiction books, THE DEAD SOUL, a thriller, and winner of the Excellence in Journalism Award (2013). He consulted on the first season of the Showtime series Dexter, has been profiled in Writer’s Digest, Connecticut Magazine, NY Daily News, NY Post, Newsday, Suspense Magazine, and the Hartford Courant. Winner of the New England Book Festival Award for I’ll Be Watching You and the Editor’s Choice Award from True Crime Book Reviews for Death Trap, Phelps has made over 200 television appearances, including CBS’s Early Show, ABC’s Good Morning America, NBC’s Today Show, The View, TLC, BIO Channel, and History Channel. Phelps created, produced and starred in the hit Investigation Discovery series Dark Minds; and is one of the stars of ID’s Deadly Women. Radio America called him “the nation’s leading authority on the mind of the female murderer.” Touched by tragedy himself, due to the unsolved murder of his pregnant sister-in-law, Phelps is able to enter the hearts and minds of his subjects like no one else. He lives in a small Connecticut farming community and can be reached at his website, http://www.mwilliamphelps.com. What We Are Reading! What Are You Reading? Exactly my type of story and genre – I love true crime – crime fiction. Thanks for this review!